—-CNN good journalism watchdog Howard Kurtz, closing his review of the new Douglas Brinkley biography of Walter Cronkite, which shows that the legendary paragon of broadcast journalism was biased, often dishonest, and frequently conflicted. The “things were different then” excuse won’t fly as a defense of Cronkite, and shame on Howard Kurtz, who is supposed to stand for ethical journalism, for trying to rationalize the obvious conclusion demanded by Brinkley’s biography. That conclusion is that there was no Golden Age of TV journalism, and that rampant liberal bias infected the nightly broadcasts then as now, but we were too trusting and unsophisticated to realize it. Kurtz spends an entire book review extracting information Brinkley uncovered that proves Walter Cronkite’s image as an objective, incorruptible truth-teller was a lie, and then attempts to make the case that we shouldn’t judge him harshly. Let the Kennedy Administration, which he supported passionately, exploit his reputation and use him in a Defense Department propaganda film. Privately lobbied Bobby Kennedy to run against LBJ in 1968, while supposedly reporting objectively on the Democratic nomination battle that year. Deceptively edited interviews to make his subjects look bad and change the context of the their answers. Lied about his conduct and motivations. Secretly bugged a committee room at the 1952 Republican Convention. Went easy on politicians he liked, usually Democrats, and used choices of words and tone to stick it to politicians he didn’t like, such as conservative Barry Goldwater. Used his prominence to inject his own opinion of the Vietnam war into the public debate, when his role was that of a reporter, not a pundit. These are only what Kurtz mentions in his review, but they are enough. They aren’t the minor slip-ups of a model newsman, but a pattern of arrogant and deceptive conduct by an unethical newsman who was protected by a level of trust he did not deserve, and exploited to his own advantage. He was also a hypocrite, urging the toughest punishment by CBS against Dan Rather for Cronkite’s successor’s use of a forged document to anchor an attack on President Bush. Rather deserved to be sacked, but it was Cronkite who had helped build the self-righteous and biased culture at CBS News that metastasized in “Memogate.” Far from having the high standard he set sullied by the broadcast journalists of today, Walter Cronkite is exposed by Brinkley’s revelations as the progenitor of the untrustworthy, manipulative journalism that has turned the free press from an ally of democracy to a cynical joke. That Howard Kurtz is making excuses for “Uncle Walter’s” false rectitude now shows how thorough and pervasive his corrupt influence was. Not exactly on topic, but somewhat related. Very Orwellian reporting. I heard this juxtaposition of stories, unbelievably, back to back on CBS Sunday morning. Quotes are not exact, somewhat paraphrased. A NATO plane killed a family of 8 in Afghanistan accidentally. NATO says it will look into the incident. In Syria over 30 children were killed in a massacre. The U.S. government says this is an act of unspeakable brutality. 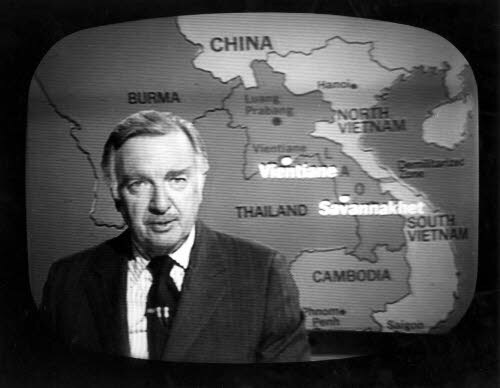 A lot of debunking has been done on Cronkite’s legacy since his retirement and death. A lot of it deserved, too. I’ll give the devil his due in some aspects, though. He DID successfully set himself up as Uncle Walter, the wise old relative with a twinkle in his eye who told us how it was while we sat at his proverbial knee. That took not only journalistic talent, but cunning showmanship as well. As a young reporter, he pulled off a number of coupes that put his feet on the road to becoming the great TV powerhouse of legend. And I DO give him high marks for this outstanding coverage of the Apollo missions. Huntley & Brinckley’s “good cop/bad cop” style at NBC had, at least, the virtue of balancing off two men in the manner of the Spartan bi-monarchy. Neither became a solitary, all-powerful icon. That, perhaps, was Cronkite’s problem in his CBS heyday. He WAS CBS news, without peer. But he had a special style that couldn’t be denied. Nobody even remembers his rival ABC clone, Ron Cochrane. McGuiness’ book on Palin gets written off sight unseen, but Brinkley’s book on Cronkite gets believed sight unseen. Got it. I actually agree with your ethical analysis here, but the first paragraph cuts so much against your prior comments that I couldn’t let it go. Brinkley is a reliably liberal/Left historian who has an impeccable reputation for getting his facts right. McGiniss is a best-seller-hungry hack in the tradition Kitty Kelley. You honestly don’t think prior conduct has a legitimate effect of credibility? When Brinkley goes after a liberal icon, I take it seriously. When McGiniss tries to smear anyone, I take it with 28 grains of salt. You don’t? The issue is you assume McGiniss must be smearing INSTEAD of taking his evidence with grains of salt. Instead of looking at it skeptically, you dismissed it out of hand and refused to look at evidence to the contrary. Reputation absolutely should figure into how much you trust something sight unseen, but you shouldn’t dismiss something as smears off that unseen. Your McGiniss position could be defensible (though still wrong) if you treated reliable authors skeptically, but you don’t even do that. You’re stretching. McGinniss, to begin with, made it clear that he was out to smear, “or find dirt”, on Palin. He even moved next door to spy on her. Has any fair historian invaded a public figure’s privacy like that? I must confess, I only read a third of the book, and then checked parts flagged by reviewers. It’s ridiculous. He uses hearsay and anonymous rumors, and even repeats rumors that he admits have no likely basis in fact. If her were a historian, he’d be shot. 28 grains of salt means “inedible.” His modus operandi is matter of record: he would never be used as a witness in any trial, because he is a demonstrable liar. Why would you be protective of assumptions against his credibility? I’d say they are fair and unavoidable. Smearing implies lying or misrepresenting. It’s putting dirt on people who don’t already have dirt on them. Finding dirt can be partisan, but it’s not smearing or lying. It’s finding true things. McGinniss clearly notes when he’s in rumour territory and points out those stories about Palin should not be believed. That’s a point in his favor, not against. As for the “hearsay and anonymous rumours”, that’s actually just “anonymous sources”. You want to see a true smear? Pretending anonymous sources that were vetted through the publisher are hearsay and rumour. I’d like to see evidence that McGinniss is a demonstrable liar. My google searching has found people calling him a liar because the person he accused Palin of having an affair with has denied it, and that before he had finished fact checking his book, he told one source that he wasn’t able to substantiate that sources’ information. That’s about it. There’s also a case of his misremembering when he made up his mind about a situation he wrote about in a prior book, but that should get chalked up to how our memory works. I’d love to see more. People will never learn. We yearn for the Superman, the hero, the honest grandfather. Seems most people are more or less dishonest, greedy and selfish/self-aggrandizing. I never feel bad anymore that I haven’t accomplished a lot in life. Most of the time the people who are honored and idolized spend their entire lives sucking up, using others to get ahead and worse.